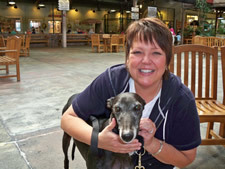 Bringing a greyhound into your home is a commitment and a decision to be carefully considered and researched. 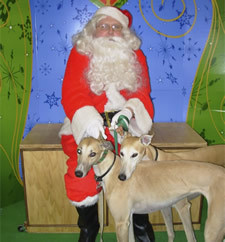 Adoptable greyhounds typically are three-four years old and can live to be 12-14. That means your hound could be a member of your family for 10 years or more. So take a realistic look at your life and consider where you’re likely to be next year, in five years or in seven years. All members of the household must want to adopt a retired racing greyhound, and be present for the homevisit. Required reading, available at the GPA/N Online Store: Adopting the Racing Greyhound or Retired Racing Greyhounds for Dummies and, if the applicant has children under 7 years, Child-Proofing Your Dog or Living with Kids and Dogs without Losing Your Mind must have been read, understood and taken seriously. 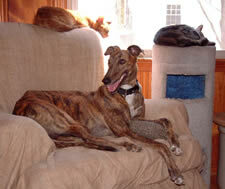 The commitment to keep a greyhound as an indoor, family companion only is agreed upon and understood. Agreeing to keep your greyhound on leash or in a fully fenced area at all times. Keeping up to date ID tags, including the tag provided by GPA/N, on your greyhound at all times. Providing GPA/N with current contact information and allowing us to follow up regarding your greyhound's well-being, including an in-person visit, should GPA/N feel it is necessary.